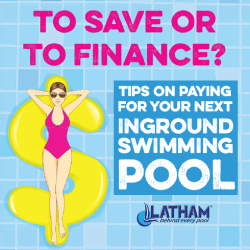 A swimming pool represents a significant investment. When you buy a car, a major appliance, or other high-end product for your home, you look for an established manufacturer with a well documented track record of quality and customer satisfaction. You should look for the same in the manufacturer of your swimming pool components. Latham Pool Products are manufactured utilizing premium raw materials and painstaking, proven manufacturing processes. Some examples are the top quality ceramic, resin, gel coat and fiberglass materials in our fiberglass pools . . . the corrosion-resistant galvanized steel in our steel pools . . . and our patent pending ultra-rigid polymer panels that reduce potential warping and bowing. In fact, thanks to our proven product quality, Latham is the only packaged pool manufacturer to receive ICC-ES Certification of its products. This ensures that building products meet code requirements. Building inspectors' #1 choice for approving building codes are ICC-ES certified products*. Because Latham Pool Products are built better, we back them better, with the strongest, longest warranties in the industry. You also have the peace of mind of knowing your warranty is backed by a company that has been in business for over 50 years – and will continue to be here for our customers, today and long into the future. Latham owns numerous patents and industry "firsts," including the first steel walk-in pool steps, first all-resin inground pool, and first vinyl liners with tile motifs and 3D patterns. Most recently, Latham developed the patent pending Ultra-Seam™ process that makes vinyl liner floor seams stronger and virtually invisible! All Latham pool components – from our wall panels to our liners, steps and safety covers – are built to work together and fit together perfectly. Your pool builder will never have the challenges of installing a pool constructed of mismatched components by different manufacturers. Speaking of our dealers, Latham is the industry leader in product and installation training. We offer regular educational sessions and conferences to keep dealers and builders up to speed on our latest innovations, installation techniques and tips. All Latham Pool Products are proudly manufactured in our multiple high-tech facilities throughout the U.S. and Canada. We build close to home so we can monitor every process for quality, and ensure prompt delivery to our customers. *Final permit approval is up to the discretion of each individual municipality's code official.